Location: Santa Monica Mountains between Topanga and Malibu. From Pacific Coast Highway, head north on Topanga Canyon Blvd. for 3.8 miles. Turn left on Fernwood Pacific Drive, just past Fernwood Market, and follow it for a total of 3.9 miles. On the way, the road changes names to Tuna Canyon. There are a lot of twists and turns, so make sure you stay on Fernwood/La Tuna. Shortly after bearing left at the intersections with Saddle Peak Road and Las Flores Heights Road, look for a dirt parking area on the right with a metal gate blocking off a fire road (Big Rock Motorway). From the 101 freeway, take the Las Virgenes Road exit and head south for 3.1 miles. Turn left on Mulholland and drive 4 miles to Stunt Road. Turn right on Stunt and drive 4 miles to Saddle Peak Road and take a slight left (this intersection also serves as a parking area for the Backbone Trail) and go 3.2 miles. Take a hard right on Tuna Canyon Road and drive a mile to the trailhead. Google Maps recognizes the address as 2804 Tuna Canyon Road, Topanga, CA 90290. There aren’t many places in the eastern Santa Monica Mountains where you can hike on a Saturday afternoon and not see a soul (or in my case, none until I was almost back to the car), but obscure Tuna Canyon Park is such a place. As the crow flies, the park doesn’t seem all that far from Malibu and Topanga, but getting there can be a little tricky, especially since the section of Tuna Canyon Road below the park is one-way southbound, meaning that it can’t be reached from Pacific Crest Highway (although if you’re coming from Santa Monica, you can return this way). Even Tuna Canyon Park’s name can be confusing; it can easily be mistaken for the similar La Tuna Canyon Park in Burbank. The good news is that once you get to the park, navigation couldn’t be easier. There are several trails and fire roads here to explore. The destination of this route is the Big Rock Lateral, a fire road in the southwestern corner of the park, where you can enjoy great ocean and mountain views. From the fire road, head uphill past the white gate and take your first right onto Big Rock Motorway. The road heads through some pleasant rolling hills, passing by some red sandstone rocks. The ocean views are good already, and will get better. After a few minutes, stay right on the Big Rock Motorway as the Budwood Motorway branches off to the left. The road makes a descent and then a short climb to reach a junction with the Big Rock Lateral. Head right and downhill on a slightly rougher road. Big Rock Lateral passes by two clearings, where you will make hard lefts and continue downhill, to the road’s end. Here you can sit and enjoy some ocean views. 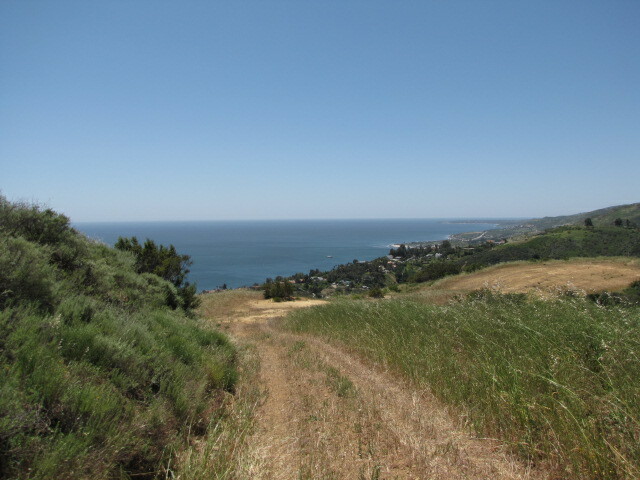 Being a reverse hike, the ascent back to the car is a bit of a workout, but you have more scenery to enjoy on the way, including Saddle Peak and Las Flores Canyon. This hike is definitely an overlooked treasure of the Santa Monica Mountains. Text and photography copyright 2014 by David W. Lockeretz, all rights reserved. Information and opinions provided are kept current to the best of the author’s ability. All readers hike at their own risk, and should be aware of the possible dangers of hiking, walking and other outdoor activities. The author does not take any responsibility for injuries sustained during hikes or walks on the routes described here. Check the informational links provided for up to date trail condition information. just found your awesome website- thank you so much!! my boyfriend and i are about to try this trail out and cant wait to do more :)!! Awesome, glad you guys like the site! Have fun & be safe. Let me just say that your website is an amazing resource — thanks for all you do. Yours is one of very few sites that even mention this hike. I just wanted to make a friendly suggestion — I tried to do this hike last weekend but couldn’t find it. Both me and my hiking companion thought your directions were a little confusing, and there was no cell phone reception up there to figure out where we went wrong. And it doesn’t help that the LAMountains.com official map says to take a road (Big Rock Drive) that has a huge gate across it! Looking forward to trying this hike again now that I have a better understanding of how to get there! And again, thanks for all of your hard work. Hi Krissy, thanks for your feedback. I’ll try to re-phrase it so the directions are clearer. Glad you’re enjoying the site though! Thanks for the directions. Nice pictures!